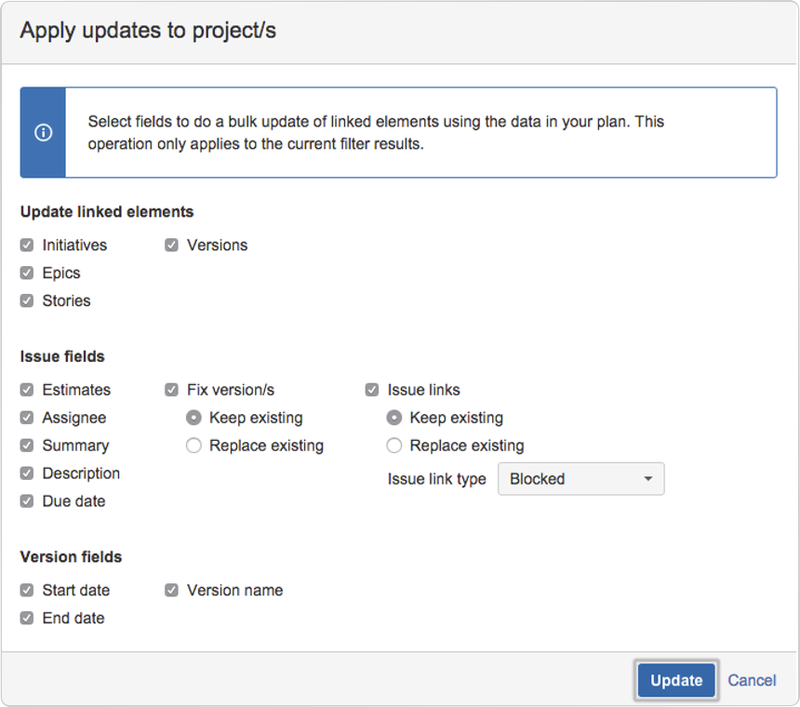 Portfolio for JIRA gives you the ability to update linked issues so that you can publish your most recent changes in your plan back to the actual JIRA issues in your project. This allows you to try out different planning scenarios, prioritize and calculate the plan, and once this is completed, update the JIRA issues accordingly. Select Plan > Apply updates to project(s) . Select all of the fields you would like to update in your project issues. Select Keep existing or Replace existing, depending on if you want to keep or overwrite the selected field in your project with changes from your plan. Select which level(s) of the hierarchy to apply updates to (initiatives, epics, stories). In addition, you can select to update the versions of linked elements as well. Estimates Updates the original (and if applicable, remaining) estimate based on the latest estimate in the plan. 担当者 Assigns the issue directly to the assigned team member. This only works if a story is assigned to a single person. If the issue is assigned to multiple people or a team, it will not update in the project. 要約 Updates the issue summary based on the summary in the plan. 説明 Updates the issue description based on the description in the plan. 期限 Sets the issues' due date to the calculated end date. 修正バージョン Updates the fix version in the project based on the release that is set in the plan. Select to update any issue links and configure how to handle existing issue links. 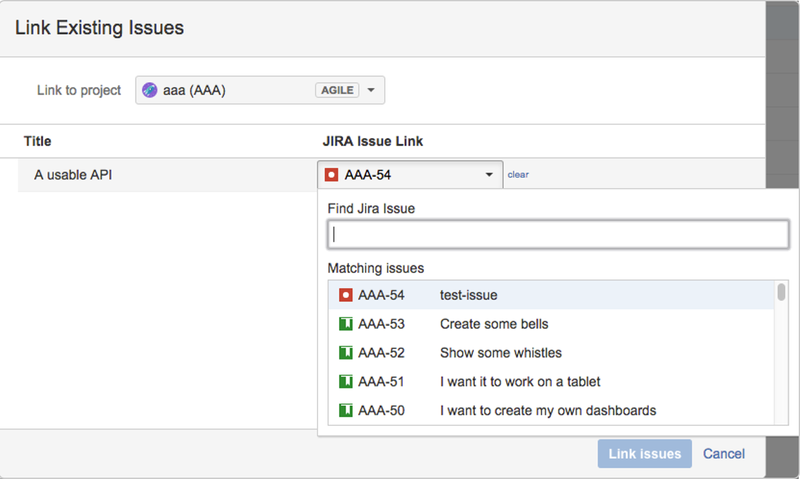 You can also select an issue link type, which are defined in your JIRA project. Start date Replace the start date in your linked project with the start date in your plan. End date Replace the end date in your linked project with the end date in your plan. Version name Replace the version name in your linked project with the version name for the issue in your plan.